Hippos bask on the shoreline and secrete an oily red substance, which gave rise to the myth that they sweat blood. The liquid is actually a skin moistener and sunblock that may also provide protection against germs. The name Hippopotamus comes from the Ancient Greek ‘river horse’. An adult Hippo needs to resurface every 3 – 5mins to breathe. The process of surfacing and breathing is automatic, and even a hippo sleeping underwater will rise and breathe without waking. They are only territorial while in the water. Both reproduction and birth occur in the water. Hippo calves weigh approximately 45kg at birth and can suckle on land or underwater by closing their ears and nostrils. Each female has only one calf every two years. Soon after birth, mother and young join schools that provide some protection against crocodiles, lions, and hyenas. Despite its stocky shape and short legs, it can easily outrun most humans. Hippos have been clocked at 30 km/h over short distances. Hippos will travel on land for up to 10km to feed. They spend four to five hours grazing and can consume 68 kg of grass each night. Considering their enormous size, a hippo’s food intake is relatively low. The hippopotamus is one of the most aggressive creatures in the world and is often regarded as one of the most dangerous animals in Africa. However, if threatened on land it will often run for water. Their closest living relatives are cetaceans (whales, porpoises, etc.) from which they diverged about 55 million years ago. The IUCN classified the Hippo as having vulnerable status in 2008. The population is in decline; most dramatically in the Democratic Republic of the Congo. 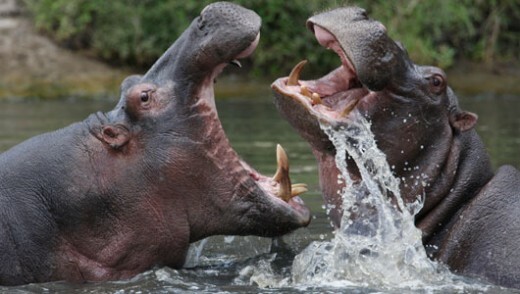 Habitat: The hippopotamus is semi-aquatic, inhabiting rivers and lakes. The school will remain in the water and mud throughout the day to keep cool. At dusk they will emerge to graze on grass.